Brace yourself: The next Resident Evil flick will contain a "mind-blowing revelation." Say what you want about the Resident Evil films, but you can't argue that they don't make money. After Resident Evil: Afterlife (pictured here) grossed almost $300 million worldwide, it was no surprise that Sony announced it was making another sequel. 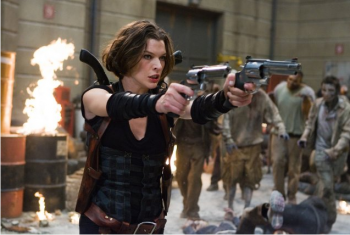 Plot details have been leaked for a while by both star Milla Jovovich and director Paul W.S. Anderson, but the official synopsis has just been released. The Umbrella Corporation's deadly T-virus continues to ravage the Earth, transforming the global population into legions of the flesh eating Undead. The human race's last and only hope, Alice (Milla Jovovich), awakens in the heart of Umbrella's most clandestine operations facility and unveils more of her mysterious past as she delves further into the complex. Without a safe haven, Alice continues to hunt those responsible for the outbreak; a chase that takes her from Tokyo to New York, Washington, D.C. and Moscow, culminating in a mind-blowing revelation that will force her to rethink everything that she once thought to be true. Aided by newfound allies and familiar friends, Alice must fight to survive long enough to escape a hostile world on the brink of oblivion. The countdown has begun. Anderson has also revealed that this next film will also include a number of fan-favorite characters and monsters like Ada Wong, Leon Kennedy, the Lickers, and "even a big action set piece directly based on one of the more famous ones from the original RE games." Re5ident Evil: Retribution is going to be released in both 2D and 3D on September 14th. A teaser trailer for the film is expected to be attached to Underworld: Awakening, which is due out later this month.